Is Crumlin road Gaol haunted? Crumlin road gaol was built between 1843 and 1845 by architect Sir John Lanyon and was one of the most advanced prisons in Ireland's. 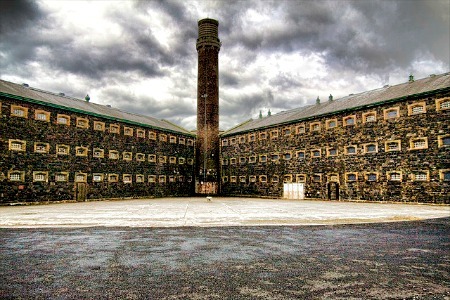 More popularly known as "The Crumb" it was originally built to hold up to 550 inmates and was the first prison in Ireland in incorporate the separate system which is having prisoners alone in their own spaces limiting communication as much as possible. The first inmates to arrive at the prison walked from another prison in chains and included men, women and children. The prison was not particular about what kind of inmates came here and accepted all ages, with reports of people as young as 10 being held. During the early 1900's women were no longer held at the prison and it became a male only institute. It was also in 1901 that an execution chamber was built in the prison and 17 people were sentenced to death by hanging until the chamber was closed in 1961. The prison stopped operating in 1996 when the inmates were moved to a more modern facility. Opposite the prison is the Crumlin road courthouse which stands abandoned. There is an underground tunnel which connects the 2 buildings which was used to transport inmates for hearings at the courthouse. The prison today stands as a grade A listed building and is open to the public for historical and paranormal tours. If you wish to visit please check with the venue directly to confirm availability and opening times. This is widely known as one of the most haunted buildings in Northern Ireland and seems to greatly deserve its reputation. There are many paranormal hotspots within the prison and you wont have to venture far into the empty corridors before you find one. As you can imagine prisons were the scene of much suffering and misery, and although only 17 people were legally executed here, there were many more that died on the grounds. One of these people was that of a 13 year old named Patrick Magee who had been sentenced to a period of 3 months for stealing. It seems he cud not handle the conditions of the prison and hanged himself in his cell in the year 1858. His cell is one of the areas of the prison were you can hear disembodied sounds, crying in this case coming from the empty cell. The execution chamber is another area of the prison were people have reported a common experience. Visitors have claimed to be overcome with very strong emotions of distress and sadness when in this area, not to mention sudden unexplainable temperature drops. The flogging room is also a well known spot for ghostly noises, as well as the apparition of a shirtless man who stands in the room staring at the floor.